Geekmax: Xbox One: Rebooting the Industry? Xbox One: Rebooting the Industry? To those who know me it's no secret that I a prefer PlayStation to Xbox. I like their business model better, and I like their games better. This article has little to with any of that, it's not about which is better and who is going to "win" the next gen console wars or who has the best exclusives. 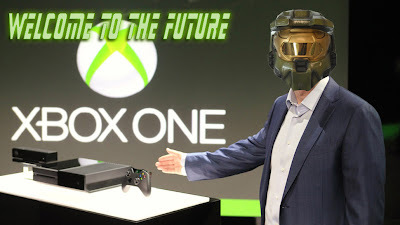 What I'm going to wright about is the future of the gaming console industry, and I believe at this time with the unveil of the Xbox One, we are at a major fork in the road. I know what many of you are thinking. "This is going to be about used games and always online." Not really, no. You can read countless other blogs about all that, (for the record, I don't like it). This is about Microsoft's vision and plans for the future, something no one is really talking about. It's all pretty obvious once you see it. It's right there in the name 'Xbox One'. Why call it "One" if there are no plans for a "Two" or "Three"? This is a reboot for Xbox, not a sequel. Sure, 'One' also means "all in one set top box", but that is just the beginning. If this works for Microsoft, then it's going to change the playing field when it comes to what game console is. No longer will they be thought of as game consoles but as entertainment hubs. The previous generation saw a major evolution in this respect. They started out as high definition game systems with major online functionality for multiplayer and DLC. However today they are also your main hub for Netflix, Hulu and other similar services. This is what Microsoft is betting on. They are counting on the fact that whether consumers are aware of it or not, these types of features, not just games, are what matter to them. As more of these type of features are introduced, and the complexity and number of services grow, so will the Xbox, perhaps with "Xbox Two" and so on. When I look at the Xbox One in this light, it starts to look more appealing. Whether or not it's going to work for Microsoft is still up in the air obviously. One thing is for certain though, core gamers, are not happy with the "required" internet connection and the inability to play used games. How much of an impact that will have remains to be seen, but if history tells us anything, when piss off your core audience, it tends to spread to the rest of the audience... but maybe Microsoft's core audience is no longer core gamers.